The documentary, Invisible Children: Rough Cut, has started a conversation about the situation in Uganda that has grown into a youth-driven political movement. In northern Uganda, children and their families live in constant fear of the Lord’s Resistance Army (LRA). This sectarian military group, led by self-proclaimed spiritual medium Joseph Kony, is banned as a terrorist organization by the United States. Recently, President Obama has pledged to send 100 troops to Uganda to fight the LRA. Unfortunately, peacekeeping forces have never been able to fight the LRA effectively due to the organization’s practice of abducting and training children as soldiers. 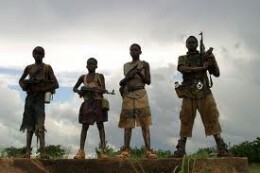 In 2003, the tragic stories of these child soldiers were brought to the forefront by three young American filmmakers. Their documentary, Invisible Children: Rough Cut, began a conversation about the situation in Uganda that has grown into a youth-driven political movement. On October 25, that movement is coming to Wright State University. A group of committed students has brought together several campus organizations to organize fundraisers and a screening of the latest Invisible Children documentary, The Rescue. The Invisible Children organization asks groups screening their films to charge little or no admission, so the screening will be free. “Their main goal is to spread the message,” said Zachary Beck, one of the student organizers. There will be a letter-writing station so that students can write to their congressmen asking them to address the issue. Dinner will also be provided for students who attend. On the day of the screening, organizers will hold a jukebox fundraiser in the Union Market from 11 a.m. to 3 p.m. Money will go towards the construction of radio towers in remote African villages. Villagers use these radio towers to communicate the position and troop movements of the LRA and to warn one another when an attack is imminent, giving people time to hide from Kony’s forces. Beck said that because it is so difficult for international forces to fight the LRA, the people of Uganda have to take steps to keep themselves safe. Invisible Children is helping in the construction of the radio tower network. The screening will take place Oct. 25 at 6 p.m. in the first floor lobby of Oelman Hall.